Kim Kirchherr, MS, RD, LDN, CDE, a dietitian for the SuperValu family of stores, which includes Jewel-Osco, Albertsons, Shaw’s, Cub Foods, and Save-A-Lot, says these feelings are completely understandable given what patients are asked to do after such a diagnosis. “A person with diabetes faces the challenge of having to ‘relearn’ the foods they have grown up with and love in the sense that they have to know how food will affect them after every eating occasion,” she explains. Fitting healthful foods into a daily diet can be difficult for anyone, but meal planning becomes even more challenging for people new diabetes-specific considerations into account. And they’re not afraid to tell you either, as any RD knows all too well the gripes most often heard from patients frustrated with diabetes dinner dilemmas. One such complaint: Meal planning is too hard. “Often people with diabetes believe they can’t eat their favorite foods and need to eat special diet foods,” says Sherr. 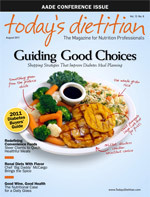 To assist patients feeling battered by an information overload and overwhelmed by the options that exist in today’s supermarkets, this shopping list of suggestions can help clients navigate toward the best foods to add to their cart, as well as those to pass by, in an effort to better manage their disease. While emphasizing that, with a little planning, everything in the produce department can fit into a healthful diet for clients with diabetes, Moon says patients can conserve their carbohydrate exchanges with some careful picking. Why: Moon likes these produce picks because they have fewer carbs per serving than starchy or super-sweet fruits and vegetables. Since many of these picks have nutrients that are impacted by medications, Kirchherr always recommends clients consult with an RD and/or a pharmacist to choose properly based on any additional medical conditions they may have. For example, “Produce is packed with potassium, which can be an issue if renal disease is present and/or if certain blood pressure medications are prescribed,” she says. Why: Robin Nwankwo, MPH, RD, CDE, likes these because they’re high in vitamin A and fiber, are easy to use, and require little preparation time. They’re also “filling but won’t increase blood sugar,” she says. Why: “Fresh peppers are high in vitamin C and add color interest to meals and sandwiches, pizza, and wraps,” says Nwankwo. In general, Sherr guides clients toward fruits and vegetables that are deep and rich in color. “Darker produce tends to have a higher vitamin and mineral content,” she says. Why: Lighter cheeses are great paired with fruit or grains to add a protein component (and a bit of fat) for a more satisfying snack than just carbohydrate alone, says Kirchherr. Why: It stands to reason then that people with diabetes should steer clear of the full-fat varieties of dairy foods, which often hide higher levels of sodium as well. “These foods tend to be high in fat, particularly saturated fat,” says Sherr. “Too much saturated fat in the diet increases blood cholesterol, a risk factor for heart disease. Why: Nwankwo also advises clients against this type of yogurt because of its low calcium and protein content per serving and the extra sugar typically added. Why: While apologizing to lobster lovers, Moon recommends against any fish that those with diabetes might be tempted to eat with butter. Why: Their easy preparation makes them the frozen section’s best pick for Nwankwo, who adds that frozen vegetables’ nutrients are often better preserved than their canned or processed varieties. Why: Choices such as these are plentiful in the frozen foods section, but clients are better off avoiding these high-fat items that can hinder weight management, says Nwankwo. Why: “Both are nonnutritive sweeteners that won’t raise blood sugar the way sugar will,” says Moon, adding that clients should know to look out for any of sugar’s code names, such as evaporated cane juice, honey, agave, corn syrup, or high-fructose corn syrup. “Clients who prefer a more natural lifestyle may prefer Stevia,” she says. Why: Agave nectar has a lower glycemic load per portion, says Nwankwo, and its sweet flavor can be substituted for sugar in a variety of instances. Why: Their increased fiber content compared with white or bleached flour makes these a great baking substitute for patients who want to continue baking cookies and cakes following their diabetes diagnosis, according to Nwankwo. Why: If clients pick these up, “Leftovers can be stored in single servings and ready for subsequent meals, like lunch or tomorrow’s dinner,” says Nwankwo. Kirchherr also recommends that in addition to storage containers, patients with diabetes pick up measuring cups and spoons, nonfat cooking spray, and any other items that might make them more likely to cook meals at home. “Having the proper tools and equipment is essential for culinary success. Making it easier to make good choices and better dishes sets you up for success,” she says. Why: These count toward fruit and veggie servings for the day and limit added sodium and sugar, says Kirchherr. “For people who rely on family or public transportation for stocking up at the store, frozen and canned goods really extend the ability to make nutritious meals between trips to the store,” she explains. Why: “The broth makes it easy to cook smarter, as you can sauté in broth and make your own soup,” Kirchherr adds. Why: In addition to being expensive, says Nwankwo, as a carbohydrate source, this pick is also easily consumed in large quantities. Plus, “Vitamins are depleted with time and exposure,” she says. Why: In addition to these items being good sources of fiber, they provide healthful snack options to avoid excess weight gain, according to Sherr. Why: Unlike what some may believe, controlling carbohydrate intake doesn’t mean eliminating them completely, says Moon. “Any healthful diet will include complex carbohydrates from whole foods that also contain vitamins, minerals, and fiber. Complex carbs will be absorbed more slowly,” she explains. Why: “The seltzer can be combined with a portion-controlled amount of 100% juice, which counts as a fruit serving, to create a more nutritious beverage vs. regular soda or punch/cocktail,” says Kirchherr. Why: Moon says these are smart picks for adding a ton of flavor with only a bit of sugar. Nwankwo adds that vinegar may also inhibit the digestion of starch in the gut. Why: Moon says with added sugars and sodium, there’s not a lot of nutrition in these types of condiments, so people with diabetes will do best to bypass them. Recommending specific foods is helpful, but offering clients some more general suggestions will help guide them toward a better (and more healthful) grocery shopping experience. She also finds that starting portion control at the store can lead to smarter shopping. “If your healthy eating plan calls for 4-oz apples, buy only 4-oz apples. That way, when you’re ready to eat one, you can grab it and go with no extra weighing and measuring,” she says. And always remember to illustrate how clients can fit into their diet both “everyday” healthy foods and “sometimes” favorite foods from their past, as clients can shut down if they think that they’re on a path to a flavorless future.